This is the third clay pot rice we had in one month. We love it so much for weeknights because it is so quick and easy to make. 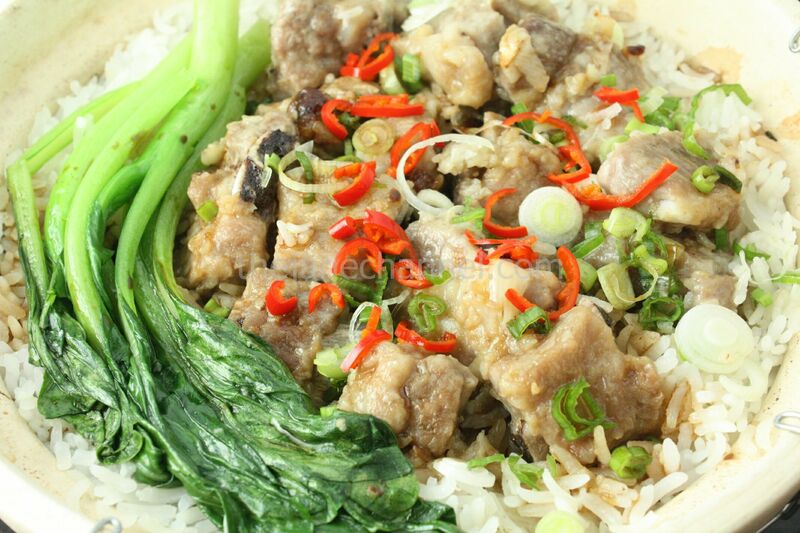 Simply marinate the pork ribs and cook the rice. Once you learn to cook it, you’ll find the rice taste so much better in the clay pot and do not want to go back to electric rice cooker. And note the only difference with this dish compared to the other two clay pot recipes is the addition of corn starch to the spare ribs after marinating for 30 minutes. This allows the ribs to absorb the flavors and keep the juices inside, so that meat is more tender after cooked. The baking soda is used as a tenderizer for the ribs. However, some people do not like its taste, so you may want adjust as needed. Sweet Soy Sauce for Claypot Rice: In a saucepan, add 3 tablespoons water, 1 tablespoon sugar, 3 tablespoons dark soy sauce, and 1 tablespoon soy sauce. Cook over low heat until the sugar dissolves. 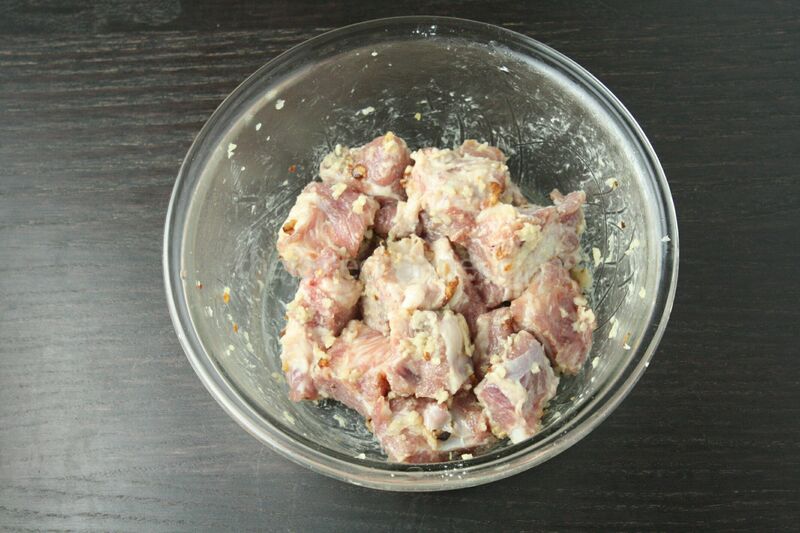 In a small bowl, combine ribs with cooked and raw minced garlic, baking soda, sesame oil and sugar. Marinate for 30 minute. Add corn starch and mix well. Rinse the rice with water until the water comes out nearly clear; drain completely. Thinly oil the inside of the claypot. (Apply oil to the pot before adding rice and water to avoid sticking and to make a crispy rice effect.) Heat over medium-high heat. Add the rice and water and cover. Bring it to boil, then lower the heat and simmer for 5-7 minutes. Turn the heat to high; add spare ribs. Cook over low heat for 10-13 minutes. Turn off the heat and cover for another 5-8 minutes or until the ribs are cooked. Add scallions, red chili and drizzle sweet soy sauce mixture over the rice to serve.